Birmingham Comic Festival and Peggy the Car. 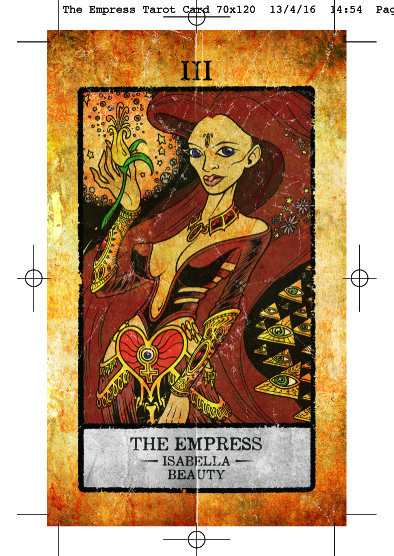 The second one day event co-organised by our good friend Steve Tanner (of Timebomb comics) took place last Saturday. The Accent UK crew this time around consisted of the old guard; Colin, Gary and myself, and as is typical we organised the transport to optimize comfort and minimize cost. Colin therefore drove to mine, parked his car in front of my house and transferred his stock to my car. We then picked up Gary, taking a small detour, before joining the M6 and heading down the 50 minutes or so stretch of motorway that took us to the Edgbaston Cricket Ground. ...he does like to see things set up just so. The day was pretty much like last year really, Sales were OK, we chatted a lot about all sorts of things, bumped into old friends (great to see Jason Cobley back on the scene) and, well, had a good time. This year seemed to have even more families attend than last and the Festival did have a really good feel to it. The Lego version of our characters drew plenty of attention as always from kids and adults alike, with the focus shifting from Kingdom to the Co-joined Twins. And then the day ended. We did a quick count up and found we'd done a little better than last year, which is a good sign. We stopped off on the way back and have a Cantonese Buffet, which was excellent and a perfect end to the day. Only it turned out not to be quite the end. On getting back to my house, having dropped Gary off, we found that Colin had left his lights on all day. Peggy, his car, was dead. The batteries totally flat. I took Colin home and returned to mine in the knowledge that tomorrow would see me meeting the RAC. It turned out to be more complicated than that and I got to meet a locksmith too, but that's a story for another day. 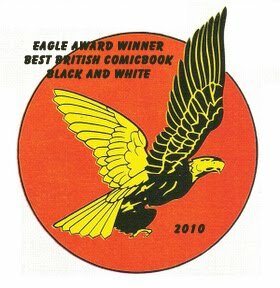 Would we go back for a third Birmingham Comic Festival ? Would I check that Colin has switched off his lights next time ? 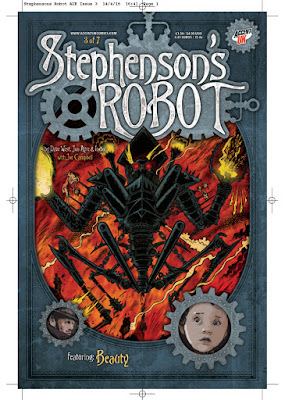 Stephenson's Robot #3 is with our friendly neighbourhood printer. Things hot up as we follow events of the other robot created during Stephenson and Brunel's competition to each beat the other to win favour with Queen Victoria. This issues back story is illustrated by co-creator of Missing : Have You Seen The Invisible Man ?, Joe Campbell and tells the story of Beauty. All wrapped up in the great design by Andy Bloor. 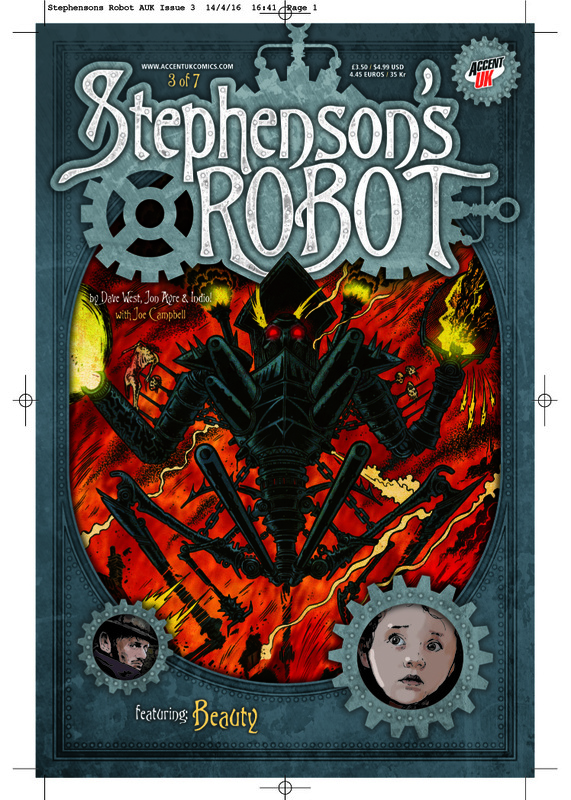 And if all of that isn't enough, there is a tarot card to accompany the issue, illustrated by Stephenson's Robot co-creator and main story artist INDIO! Hopefully both of these will be available for the London MCM at the end of May. 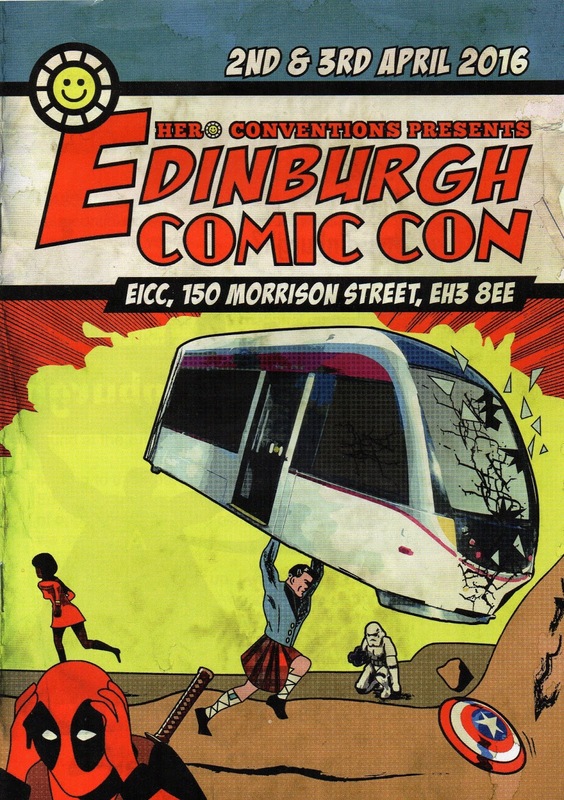 We'd heard good things about the previous two Edinburgh Comic Conventions but due to clashes with some of our regular events we'd never been able to make it up to Edinburgh before. 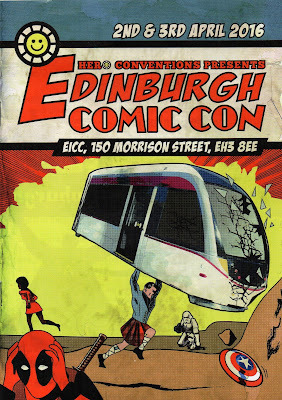 This year it had moved to its new venue at the EICC. It's a long way from Crewe to Edinburgh. It's a 4 hour drive or, as Colin found out, a 5 hour train journey. Anyway, let's not focus on the negatives. Let's talk about the positives. 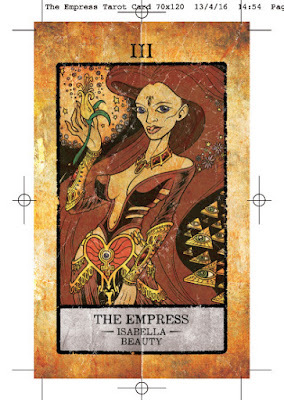 The new venue promised to prevent any of the over crowding complaints of the first two Cons and the very central location made this very easy for fans to find. As a relative newbie to Edinburgh even I managed to find the place. Finding the loading bay proved more of a challenge though, but it didn't defeat me. Saturday morning then found us all ready and raring to go. The one table meant that we had to leave some titles at home, notably my little hard covers but the table still looked great, with a wide range of titles. It was your typical slow start but at around 11.30am it got really busy and this period pretty much lasted until around 3pm. During this time we sold out all but three of the WesterNoir - First Season Sketch-packs. At 3pm however it went very quiet and sadly that lasted for the rest of the day until closure. Saturday night saw us in a Curry house talking about the day. The Con had a really good feel to it. 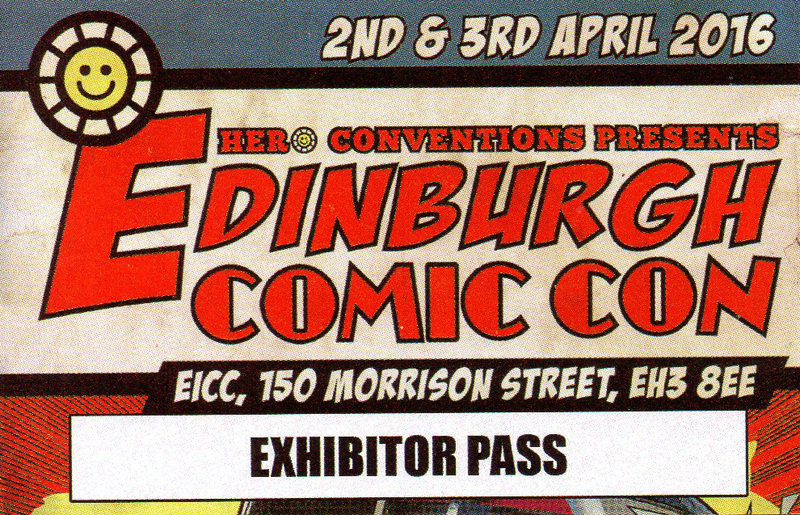 Plenty of people were interested in what we were doing, everyone was there to have a good time and whilst the Scottish Mr. Fudge seemed to be doing well, he hadn't sold out, which for me is a good sign as it says people were wanting to spend their money on other things ... like comics. Sunday was actually almost a duplicate of Saturday, almost down to the number of comics we sold. The main difference was that there were more families on the Sunday. cold by the time I get them, I asked for water this time. lukewarm water is almost as bad. There wasn't as much cosplay as there is at other events, but I think that'll change over the years ahead. The costumes that were on display however were pretty impressive. This one of Baby Groot was fabulous and she even did the dance. And it's always great when someone in SteamPunk clothing buys a copy of Stephenson's Robot. 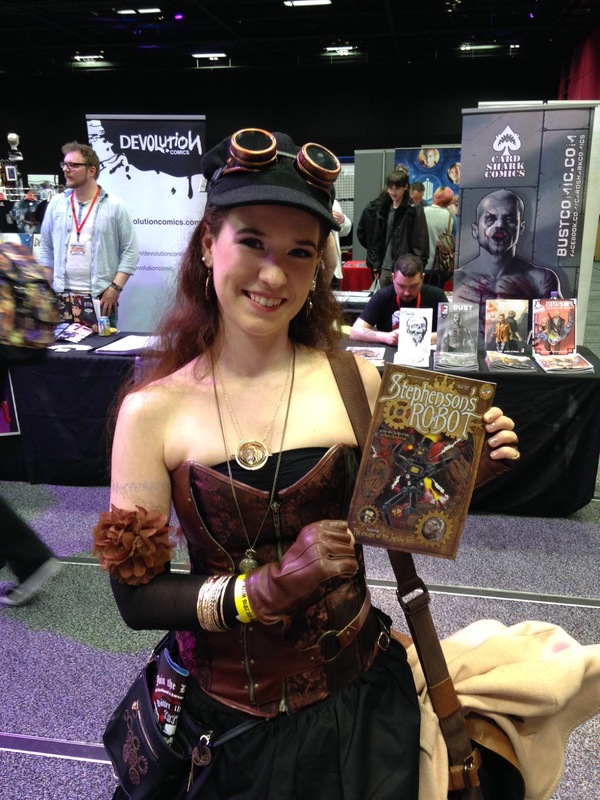 OK, I gave this lady a copy as a thank you for the photograph, although she did buy a couple of anthologies which was nice. 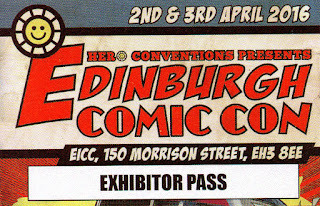 At the end of a thoroughly enjoyable two days we'd met a lot of new customers, met a few who we'd seen before in Glasgow, chatted to a lot of very interesting people, seen some great costumes and had customers come and buy more on the Sunday having read of their purchases from the Saturday. A great show that we'll return to.